Richard is a graduate of Pueblo High School (1975) where he was a state wrestling champion (individual and team, 1975) as well as winning several AAU wrestling titles. 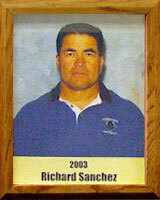 In 2002 he received the Individual Achievement Award from Chicanos Por La Causa; the Hispanic Sports and Academic Achievement Award named him Arizona Coach of the Year; and Barry Sollen Bergus of Arizona Prep Football Magazine named him Coach of the Year. The Arizona Cardinals named him its Coach of the Year in 2001 and the Arizona Coach’s Association recognized him as its all-star football coach.